Black or bordeaux evening skirt, check. White or ecru silk shirt, check. Every women has her holiday standbys, in pant or skirted version. At a certain point, you can throw it on mindlessly. But why not splash out a bit? 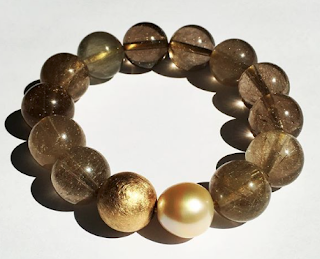 Spending on evening accessories might feel frivolous but they are the magic ingredients for looking more gorgeous than you ever thought possible, and doesn't that feel like a gift in itself? Shown, Talbot's ensemble available in December. Simple, useful, but safe. When I see a woman in this bland party wear, I want to slip her an Old Fashioned and a wad of fifties, and say "celebrate yourself". 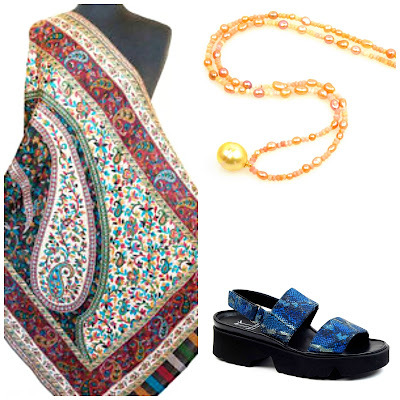 Below, a few head-turning additions for standing under mistletoe or enduring a business party. All you need is one little thing that's unique, enchanting and specifically for evening. Your posture, attitude and enjoyment of the evening will rise. 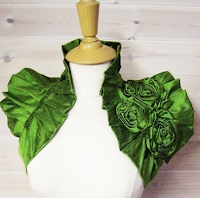 Etsy seller bonzie's du iponi silk wrap, $85. Based in Waterford, Ireland, bonzie makes romantic and unique items. Silver Gretal Lace Print Tights, Bebaroque, £45.00 from Liberty. Intricate detail in a metallic palette; these tights take a knee-length skirt from safe to seductive. 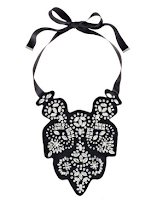 Malene Birger embellished felt necklace, $265 from net-a-porter. Don't buy another dress, buy this. A seriously well-designed yet playful piece, worth every penny. 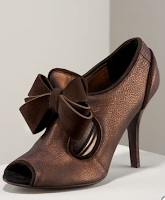 Nanette Leop ore Peep Show Booties, $395 from Neiman Marcus. What they will do for your LBD, your pencil skirt, crepe pants– anything that needs a new lease on party life! A woman of 50 or more has earned the right to the hat and the cocktail. Cocktail hats work on any hairstyle, but look best with dresses. This black velour with coque feathers is only $70 from Artikal, and would make you feel like Ava Gardner. Daytime jewelry does not usually work for parties, so unless your life allows for investment in evening pieces, mix your real with costume. 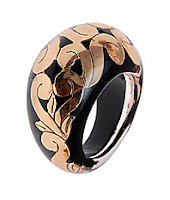 Aldo "Castonguay" cocktail ring, $10 on sale. 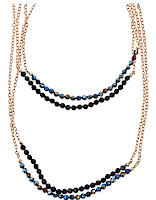 Throw on a several Aldo "Caps" beaded chains, at $20 each. All glammed for $50. 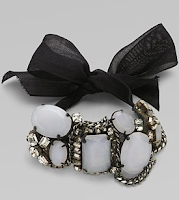 Vera Wang's moonstone and crystal bracelet with silk ties, $250 from Saks Fifth Avenue. Walking into a party in your practical everyday coat is like serving stale breadsticks with your best recipe. 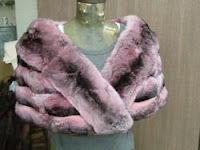 Pink chinchilla wrap from eBay seller dwachte915, BIN price, $1,950. A luscious wrap is not such an extravagance because the shorter-haired furs will last decades. 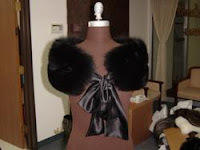 The same seller has a divine YSL-style black fox capelet with satin ribbon tie for $395; wear as a collar or off-the-shoulder stole. The simplest LBD will sparkle. 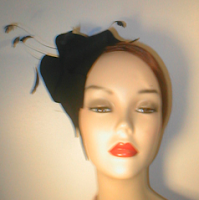 See this seller's eBay store, W Furs Wholesale to You, for other colours for both pieces. I've enjoyed amazing fur buys through eBay vendors. My particular party parsimony is the evening bag. I rely on Le Duc's pockets too often. But Aldo to the rescue again, the sleek "Stayrook" comes in silver or gold for $25. If you're willing to spend more than I am, Carlos Falchi's python clutch, $875 from Saks is on another level, a luxurious and classic bag. Shop now for the best selection, because many women will enter party panic mode soon. Besides, it's fun. When I step into evening wear, I always feel, in the first few seconds, like the little girl playing in my mother's finery again. Oh I love these selections and you make me ready to play dress up and go to the holiday parties. Great choices, and I always think that lovely basics with some fabulous over the top piece is what makes parties fun. Everything you show would make a LBD or a dress of a different color pop and sparkle. I'm sorry, but I never saw the point of the first outfit, safe yes, but dressing should be fun as well as practical, especially dressing up. A great post once again! Oh, that Talbot outfit is so boring and you are right: Safe, too safe. I wish to own one great outfit, and then accessorize it up, up or down. Okay, maybe two, in these climates. The YSL fur with the large ribbon is great, I also liked the Vera Wang bracelet, but I have invested in bags ( maybe shoes too ), so they play a major role in my partying. I don´t wish to look like a Xmas tree, so I´ll have to keep my jewelry at a reasonable level. Well, this is easy, as I have so little left. My favorite purchase for evening was a burgundy satin clutch purse discreetly studded with crystals which I found at Target for $15 two years ago. I have taken it so many places and it's still in perfect shape. Who would have thought? What I would love to find for a basic evening ensemble is a winter-white/ecru tuxedo suit with small lapels or a shawl collar. Duchesse and friends, have you seen anything like this recently? if I ever have to go out, I hope you will wave your magic wand over me! Dressing up, especially for winter parties and festive occasions, is such fun -- only wish I had more opportunities for it! You have some great suggestions here -- getting me in the party mood! These are gorgeous selections, Duchesse! I love that green shrug especially. Over the years, it seems that the number of events in my life where this level of dressing up would be appropriate has dwindled down to nothing. Our company no longer throws a swanky holiday party. Friends' parties are mega-casual. It's a shame really. I keep thinking about throwing an old-fashioned cocktail party for the holidays, but I don't know anyone who would actually dress up for it. I don't know if things will ever turn around, but right now it feels like "Puttin'on the Ritz" is a thing of the past, at least in my part of the world. Mardel: Suspect the first outfit is meant to be a base, but wondered that myself. metscan: We live in a climate where fur is useful and can be worn for many months. LaureAnn: Target strikes again. I really balk at spending huge money on an evening bag. Frugal: Sure- but you have your own magic at thrift shops! Pseu: Why not Mad Men theme it? I love dress up- short of ballgowns- cocktail dress or evening pants/dressy top just feels so much more like a party to me. LaurieAnn: Suggest you have it made. Do you live in Toronto? If so, Studio No, 136 Adelaide East would offer the level of tailoring this requires. She has done outstanding work for several friends, and not terribly expensive. Duchesse: Oh how I wish I lived in or near a major metropolitan city like Toronto. I live in California's central valley about 2 hrs. 30 min. from San Francisco; virtually everything I purchase is via the internet or on travels. Your suggestion to have the tuxedo custom made is a good one. I'll try and locate a dressmaker in the Bay Area. I'm sure that won't be difficult. Deja Pseu: I would love to come to a party where "cocktail" or some other dressy attire was requested. If you decide to throw one I think you may find that your friends would enjoy the opportunity to socialize in their finery as well. LaurieAnn: Evening attire need not be really dressy, but I feel dispirited when a guest shows up to a Saturday evening party in super-casual jeans and running shoes. Of course a cottage bbq or tailgate party is another matter, but when I've cooked for several days and hauled out the linens and china, I like to see people who don't look like they came straight from the grocery store. I adore your choices here, Duchesse! The shoes, the felted necklace especially. As usual, thank you for finding them for us to peruse. Now, if I only had some places to wear such finery. Holiday parties in my neck of the woods are sooo casual. I agree with your philosophy of adding something spectacular to the basic safe setup. Great items! Holy Cow! I keep wondering if I should sell my Saga fox fur jacket--It was my aunts--very 70s and obnoxious. I have never worn it. Karen: Sell, or is it the kind of thing a teenaged or 20ish girl whom you know would love? One of my son's 22 year old friends, Coco, came over wearing a 70s fur jacket (from Value Village) and looked adorable. Frugal, I wish I'd have been able to transport you to my posh church bazaar, Ste-Madeleine d'Outremont. Though alas I didn't find any evening wear that fit me or suited me this time - it has happened. I don't really have many events that call for this kind of clothes, and I'm working at the few that do, so I'm even more anonymous (all in black, usually) than the first pic of the dull lady. But at least not many people would show up in scruffy jeans and certainly not in running shoes. Those who show up in black or dark denim jeans have the arse for them and fine leather booties + jackets. Most people dress fairly well though a little more boho. One manfriend of a more than certain age (he is in his 70s) who is a scholar of Latin American studies, has a collection of those wonderful tucked formal shirts usually in linen or cotton, sometimes with self-coloured embroidery, that men wear in the Caribeean, Mexico, Central and the northern part of South America. I do have a very pretty embroidered evening bag, but it is rarely practical when I'm either taking public transport or trudging through the snow, carrying victuals and pretty shoes to wear once at the party. lagatta: Overdressing- something I certainly want to avoid too! Loose jersey pants and a cashmere or silk/cashmere top with jewelry helps me inhabit that middle ground. Le Duc wears those shirts, called guayaberas in Spanish, in the summer. Dashing tropical menswear. Carrying shoes, my bête noire. Can you imagine the attire for the party at Fezziwig's place having been casual? What has happened since then...or at least since the 60's...the 1960's that is? I sympathize with all those that have no occasion to wear the finer duds. I recall a time about 30 years ago when a friend remarked that she hoped that she would have some occcasion to wear a strapless gown in her life time. Well, lucky for her she has had plenty since then! But even if a black tie affair is not in your future, you can still stash the jeans for a more fashionable look. I agree that the Talbots outfit is not exciting, but maybe in really luxe fabrics and a sparkle or two, it would come alive. And Duchesse, the advice to Laurie Ann is quite good- find a tailor or dressmaker and have the tux made. In winter white, you'd be stunning at any social event of the season. Be the lady in white in a sea of blackness. The Mad Men idea is a another great one. That may have been the last true decade of everyone dressing up. Pseu, Who was it that said, "Never worry about being overdressed, worry instead about being underdressed"? And keep in mind the words of Crash Davis. In a scene from Bull Durham, trying to get Nuke LaLoosh to throw out his old flip flops, he holds them up, points to the fungus on them and instructs, Think classy, you'll be classy." I understand how people fall into the habit of casual dress for parties- "no fuss", "keep it easy". But it is so much less fun. 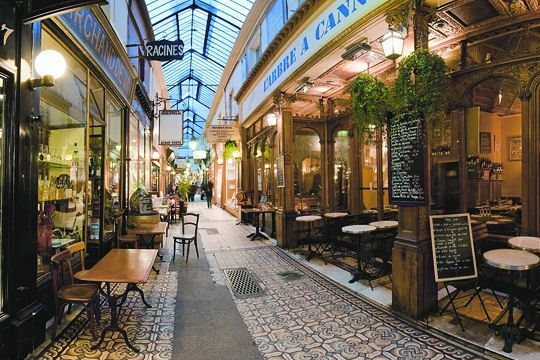 I think it's a relaxation of social custom over time, part of same trend that causes (some) men to visit good restaurants in baseball caps which they keep on, while checking their BlackBerrys at the table. But the relaxation is not universal; all of the parties we attend at holidays are dressy; the men may wear a suit or not, but the women are always in party attire. Duchesse, you are right, the relaxation factor has crept in over time. However, I get a chuckle when people say they need to be comfortable, hence the sweat pants, jeans and other overly casual items being worn virtually everywhere. What is more comfortable than well fiting clothes in luxurious fabrics-no matter what the style? I'm lucky too in that I do get to attend black tie affairs and several cocktail parties each year that are the perfect opportunity to wear the items you describe in your post.